A couple of weeks ago I reviewed Primeval New World, the Canadian spin off series of the UK’s Primeval. 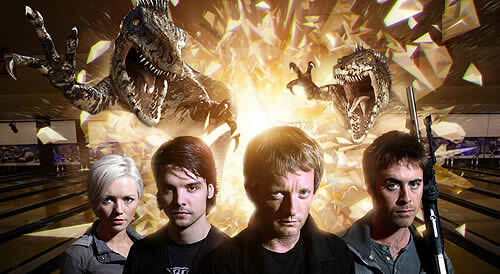 If you like you can read it here: http://www.fruitlesspursuits.com/2013/04/primeval-new-world-review-5-reasons.html People commented and told me to watch the original series, so here I am giving it a go and reviewing it along the way. My disclaimer has to be that Primeval seems to be of its time. I am watching it in 2013 when digital technology is a lot better and we are spoiled with amazing and life like graphics that defy imagination. Primeval seems to be underfunded and therefore, the dinosaurs and creatures featured sometimes shatter the suspension of disbelief. Before seeing Primeval New World many people warned me off Primeval saying that it was boring with poor CG and not worth the time. My opinions can be found under the jump. Before you go there, if you are still thinking about watching Primeval unspoiled or sullied, I will say this; get yourself a Bene. A Bene is a friend who loves Primeval already and will agree to watch it with you, at least for the first season, so that when you yell at the TV (there will be yelling) or you feel like you can’t go on (it has its moments), your Bene can gently assure you that it’s worth it and it will get better. Note: My friend happens to be named Bene, I am sure any friend of any other name with similar strength and qualifications will be suitable. Enough rambling... let me tell you about Primeval seasons 1 and 2. When I tried to watch this show alone I didn’t make it through the first 5mins. I needed to phone a friend. We gathered tea, food and strength and sat down together. Primeval’s first season is pretty terrible to be honest. I can understand why people gave up after a couple of episodes, because the first two episodes were truly horrendous. The CG was shocking, the story barely held together, there was no explanation of characters and the whole thing was very frustrating. Why? Because on the face of it, it still seemed like it could be an interesting story if only someone would give it some money and some time. The rest of season one stumbles along, rarely explaining anything. It shows our heroes fighting off prehistoric creatures with fair success, though generally it doesn’t show that very well. Where there are gems of hope are in the overarching story about the anomalies and how they work. This rag-tag team might not have much idea, but Cutter’s wife Helen, whom he thought was dead for 8 years, has been traversing them and seems to know an awful lot. She held my intrigue in season one because I really liked the idea that someone found them and decided to explore, even though she seems to be a terrible human being. The season finale is much more promising with a revelation that timelines can be crossed and that stepping through these anomalies can change things, Cutter returns to discover that Claudia, a member of the team and his new romantic interest has been seemingly deleted from our timeline. Here’s where the story gets good and season two is a damn sight better than season one. This is the pilot season the show should have had. Yes, still finding its feet but definitely telling better stories and developing the characters with more success. That’s not to say there aren’t annoying things that happen or terrible plot holes, but it is generally better, it’s engaging and it doesn’t result in me screaming at the TV quite as often. Helen has some grad plan of doom and she is manipulating the team to come good on it. In the meantime, the whole timeline has had a makeover. Home Officer is now the ARC (Anomaly Research Centre) and they have proper weapons and technology. This was a genius move, no need to explain how because the viewer is in the same position as Cutter, he doesn’t know how, he just has to accept it. This all makes much more sense when it comes to the true threat that the anomalies and the creatures pose. Claudia comes back but remade as Jenny, a PR professional recently added to the team. This is another genius move as it serves to increase the jeopardy of our characters and attempt to fix a character that might not have been working as well. Unfortunately, Jenny has more personality but isn’t quite as interesting as Claudia could have been. Connor and Abbey develop into more fully fledged characters, though the others don’t quite cut the mustard for me... more on that later. How can we overlook Rex the flying dragon lizard and his adorableness? The finale reveals many creatures caged and being used as some kind of experiment that Helen wants to pull to see how she can influence the future. So far, it’s getting better, it’s holding my interest and I watched the whole second season by myself; no Bene needed. So how does it stack up then when we look at the 5 reasons why I suggested Primeval New World should be renewed? 1. Strong female characters? Not so much. Primeval does lack what New World has in the way of a myriad of well developed female characters. Abbey comes very close, but we don’t get enough back-story of hers. Jenny/Claudia doesn’t come close as she seems to be used more like a prop than a real character in season two, I hope this changes. Connor dates a squirrely double-crosser who later redeems herself somewhat, but again, we aren’t given much. Helen is a complete caricature that is very difficult to like let alone identify with. The writers use strength tropes to try to say that she is tough and therefore we should be happy, but this viewer wasn’t happy. I don’t class stereotypes as enough when it comes to creating complex and strong characters in general. Watch this space and see. 2. Great Dinosaurs? You won’t really find them here. Sorry guys, the CG is atrocious most of the time and Primeval tends to steer clear of most of the big name dinos. I did like the raptors and loved the Mammoth though so there is hope and room for improvement. I really think the show would have benefitted from a bigger budget. I also think it’s cool that some of the lesser known dinos are in the show. If only it encouraged people to look them up as opposed to screwing up their face and thinking it’s a made up creature. 3. Great Plot? Not so much in terms of episode to episode plots. They often feel like the writer gave up trying to solve the dilemma and wrote something silly to sort the story out. The overarching plot however, is very interesting with affects on the future being revealed, timeline shifts, questions about whether we should control the anomalies and the anomalies themselves. It has a lot of potential. The character development seriously lacks though. We never in two seasons really get a handle on why Stephen and Cutter even have a close friendship, why the hell Stephen always seems to know so much about combat and guns or why he chose to have a relationship with Helen. Cutter is irritating and I can’t really relate to him. Jenny as I said before is the same. Who I can relate to and who I think has the best chance at saving this team bond is Abbey and Connor and their underdog achievements. They are by far the best characters. I am not hating Lester either surprisingly, his calmness amuses me. I think Helen serves a great purpose but they are going to have to be careful not to make her too much of a caricature for too long. She’s already there, and the longer she stays there, the less believable she is as a threat. 4. Crossover doesn’t really apply here, so what I will say is that I want more of this timeline surfing! 5. Finale cliff hangers. Look, both finales have been quite strong so far. Have they left me panicked and wanting more? Only a little. Season two’s ending with Stephen biting the dust was actually marred by Helen’s last scene at his grave, smirking with all the clones. Weird and pathetic. They should have left it at Stephen is gone, the team is heartbroken, and what are they going to do now. Much more devastating and heartfelt. The season one cliff hanger was perfectly executed with Cutter and Helen being the only people who remembered Claudia. All up, I am going to keep watching, though I think thus far I have enjoyed New World more in roughly the same amount of episodes. I am glad though, that I watched New World first. I think not knowing about junctions and the future anomalies or experiences of the other team really improved my viewing of New World and made the reveals really ping. I’ll be back soon with another instalment of anomalies and dinosaurs.